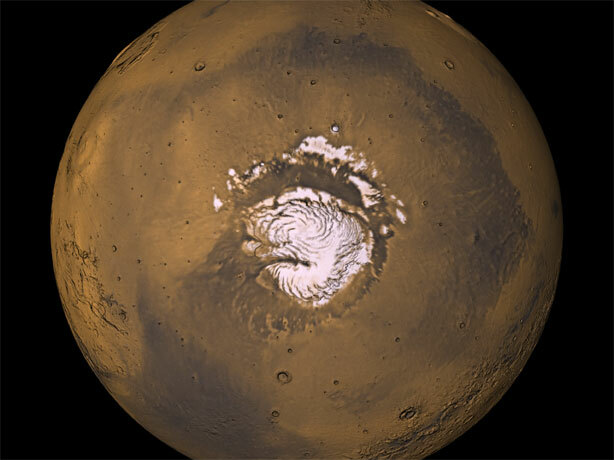 Click here for an animation of Mars water. NASA's Mars Odyssey spacecraft is revealing new details about the intriguing and dynamic character of the frozen layers now known to dominate the high northern latitudes of Mars. The implications have a bearing on science strategies for future missions in the search of habitats. 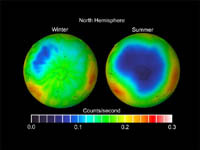 Odyssey's neutron and gamma-ray sensors have tracked seasonal changes as layers of "dry ice" (carbon-dioxide frost or snow) accumulate during northern Mars' winter and then dissipate in the spring, exposing a soil layer rich in water ice-- the martian counterpart to permafrost. "Once the carbon-dioxide layer disappears, we see even more water ice in northern latitudes than Odyssey found last year in southern latitudes," said Odyssey's Dr. Igor Mitrofanov of the Russian Space Research Institute (IKI), Moscow, lead author of a paper in the June 27 issue of the journal Science. "In some places, the water ice content is more than 90 percent by volume," he said. Mitrofanov and co-authors used the changing nature of the relief of these regions, measured more than 2 years ago by the Global Surveyor's laser altimeter science team, to explore the implications of the changes. This is a mosaic of the northern hemisphere of Mars as seen Viking. Mars Odyssey's trio of instruments, called the gamma-ray spectrometer suite, can identify elements in the top meter (3 feet) or so of Mars' surface. Mars Global Surveyor's laser altimeter is precise enough to monitor meter-scale changes in the thickness of the seasonal frost, which can accumulate to depths greater than a meter. The new findings show a correlation in the springtime between Odyssey's detection of dissipating carbon dioxide in latitudes poleward of 65 degrees north and Global Surveyor's measurement of the thinning of the frost layer in prior years. "Odyssey's high-energy neutron detector allows us to measure the thickness of carbon dioxide at lower latitudes, where Global Surveyor's altimeter does not have enough sensitivity," Mitrofanov said. "On the other hand, the neutron detector loses sensitivity to measure carbon-dioxide thickness greater than one meter (3 feet), where the altimeter obtained reliable data. Working together, we can examine the whole range of dry-ice snow accumulations." Blue colors indicate water ice observed by Odyssey during the northern winter months, when carbon-dioxide covers the surface. "The synergy between the measurements from our two 'eyes in the skies of Mars' has enabled these new findings about the nature of near-surface frozen materials, and suggests compelling places to visit in future missions in order to understand habitats on Mars," said Dr. Jim Garvin, NASA's Lead Scientist for Mars Exploration. 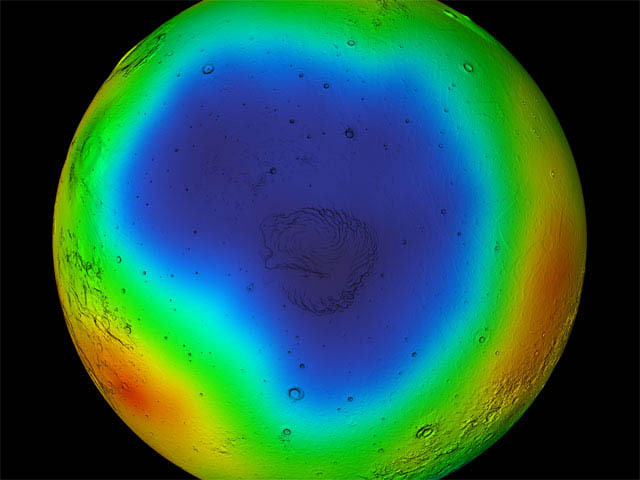 Blue colors show the water ice that is revealed during the martian summer. "Mars is constantly changing," said Dr. Jeffrey Plaut, Mars Odyssey project scientist at NASA's Jet Propulsion Laboratory, Pasadena, Calif. With Mars Odyssey, we plan to examine these dynamics through additional seasons, to watch how the winter accumulations of carbon dioxide on each pole interact with the atmosphere in the current climate regime." Mitrofanov's co-authors include researchers at the Institute for Space Research of the Russian Academy of Science, Moscow; MIT, Cambridge, MA; NASA's Goddard Space Flight Center, Greenbelt, Md. ; TechSource, Santa Fe, N.M.; and NASA Headquarters, Washington. Feldman's co-authors include researchers at New Mexico State University, Las Cruces; Cornell University, Ithaca, N.Y.; and Observatoire Midi-Pyrenees, Toulouse, France. A comparison of the water ice detected by Odyssey in northern summer and winter seasons. In some places the water ice content is more than 90 percent by volume. 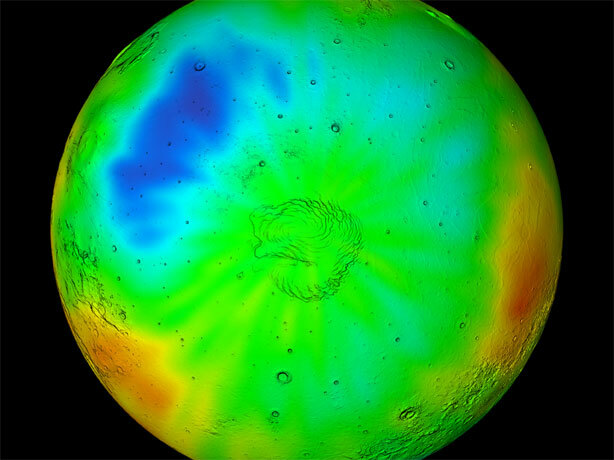 About the images: The images and animations were rendered by the Scientific Visualization Studio at the Goddard Space Flight Center by data provided by the Mars Odyssey and MGS Mars Orbital Laser Altimeter (MOLA) Science teams.